This form is used by a seller’s agent when entering into the employment of an owner of a property as their sole agent for a fixed period of time, to list the property for sale, locate a buyer and sell the property. The following instructions are for the preparation and use of the Seller’s Listing Agreement, RPI Form 102, with which a seller employs a broker as their exclusive agent to market a property for sale and locate a buyer. Enter the date and name of the city where the listing is prepared. This date is used when referring to the listing agreement. 1.1 Listing start and end date: Enter the date the brokerage services are to commence. Enter the expiration date of the employment period. The expiration needs to be set as a specific date on which the employment ends since an exclusive listing is being established. 1.2 Broker’s/agent’s duty: States the broker and their agents promise to use diligence in their effort to locate a buyer for the listed property. The agency duties a broker and their agents owe the seller are always implied, if not expressed in writing. 2.1 Advance fees and costs: Enter the amount of deposit negotiated to commence the brokerage services. a. Fee on any sale: States the brokerage fee is earned and due on 1) presentation during the listing period of an offer for the price and terms sought under the listing, or 2) any sale, exchange or option of the property agreed to by the seller during the listing period. 3.3 Hourly fee: Enter the negotiated dollar amount for the broker’s per-hour fee. The hourly fee is earned for time spent on behalf of the seller if the property is not sold, exchanged or optioned after a diligent effort is made to market the property and locate a buyer. Enter the maximum amount the broker can earn on a per-hour basis. 4.5 Conflict of interest: States the broker may have or will contract to list comparable properties or represent buyers seeking comparable properties during the listing period. 4.6 Mediation provision: Provides for the parties to enter into non-binding mediation to resolve a dispute remaining unsolved after 30 days, prior to filing an action. 4.7 Attorney fees: Entitles the prevailing party to attorney fees if litigation results from the seller’s failure to pay fees or the broker’s breach of an agency duty, unless the prevailing party proceeded with litigation without first offering to enter into mediation. 4.8 Choice-of-law provision: States California law will apply to any enforcement of this employment. 5.2 Encumbrances of record: Enter all financing of record which are liens on the real estate, including information on amounts, payments, interest rates, impounds, due dates and type of lenders. Mortgage information submitted to the MLS or included in a marketing (listing) package gives a prospective buyer the alternative of making an offer which includes the existing mortgage as part of the purchase price. 7. Listing package addenda: Check the appropriate boxes and attach each addendum to be prepared or reviewed by the seller for inclusion in the listing package. The addenda will contain the seller’s representations about the property needed by the broker to properly market the property to locate and induce prospective buyers to purchase the property. 7.1 Non-listing package addenda: Check the appropriate boxes and attach each addendum prepared by the broker and reviewed with the seller to disclose the costs the seller will incur on the sale of the property. a. Cash price: Check the box to provide for the price to be paid in cash on closing. The seller is to discharge and clear all liens from title, either themselves or through escrow. b. Mortgage assumption: Check the box if the seller will allow a buyer to pay a cash down payment (to cash out the seller’s equity) and assume the mortgage(s) referenced in section 5.2.
c. Carryback financing: Enter the amount of the down payment the seller will accept. Enter the amount of any existing financing the seller will allow a buyer to assume. Enter the amount, terms of payment, interest rate, the number of years for monthly amortization payments, and the due date for carryback financing the seller will accept from a creditworthy buyer. 10.1 Seller will option: Enter the amount of option money the seller will accept to grant an option to a buyer. Enter the period during which the option may be exercised. 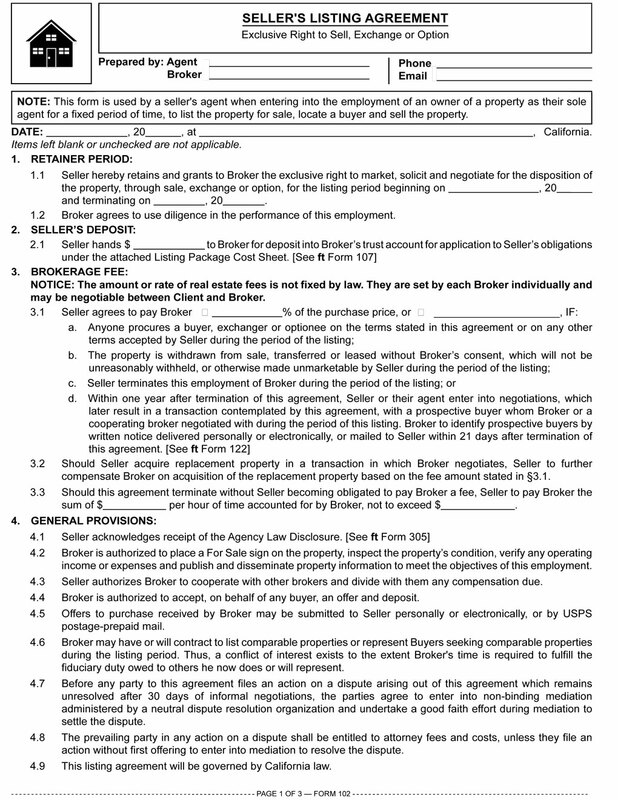 11.2 Additional terms: Enter any additional terms stipulated by the seller. Broker’s/Agent’s signature: Enter the date the listing is signed. Enter the broker’s name and CalBRE license number. Enter any agent’s name and CalBRE license number. Enter the broker’s (or agent’s) signature. Enter the broker’s address, telephone and fax numbers and email address. Do you have an open listing ( non exclusive)? Can I use the form 102 and simply add: this is a non exclusive listing? Thank you for your inquiry! Unfortunately we do not produce an open listing agreement form. As a matter of policy we typically advocate for the use of an exclusive listing agreement.